Undoubtedly, CJS is New Orleans' premier classic jazz orchestra. This group has acquired a unique following of music lovers that spans the generations. Young and old, are among the eager when the band takes the stage. CJS's performances have been mesmerizing. After thoroughly enjoying the music one begins to understand why New Orleans is the birthplace of jazz. The CJS repertoire includes creole jazz from the early years as well as music from Jelly Roll Morton, King Oliver, Louis Armstrong. Duke Ellington. McKinney's Cotton Pickers, Mills Blue Rhythm Band, Jabbo Smith, The New Orleans Owls, The Astoria Hot Eight and many others. CJS had the honor of performing the world premier of Jelly Roll Morton's lost manuscripts and got rave reviews for a classic jazz program of Jelly Roll Morton, creole and other classics performed with the Corpus Christi Symphony Orchestra. Their CD "IN SEARCH OF KING OLIVER" was the subject of a PRI radio program of the same name. 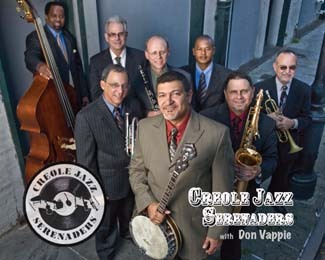 The CD "CREOLE BLUES" is one of OFFBEAT MAGAZINE'S essential 100 CDs of the 20th century from Louisiana and has been featured on Delta Airlines inflight music program as well as Nick Spitzer's American Routes radio program on NPR. We know you'll enjoy our performance and we look forward to playing for you in your town. Check our performance schedule and come on out and enjoy the music.